Protect your precious religious items with our Chi Ro Brass Pyx. The Chi Ro is one of the earliest forms of Christogram and is also one of the most popular in the Catholic Church. This Christogram is often used as a representation of the crucifixion of Jesus Christ as well as cementing His status as the Christ. This pyx features the Chi Ro image on the green enameled cover while the high quality pyx is made from pure brass. Made from Italy, this pyx can hold up to 6 hosts. 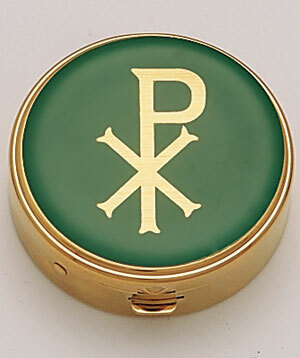 Our Chi Ro Brass Pyx is the perfect gift or token for those who devote their lives to serving the Lord. Send this, together with a rosary, crucifix and Holy Bible and you have the perfect gift set as a token of your gratitude to your local priests. Aside from being the perfect gift for priests, this pyx also makes a great case for your religious items like rosaries, cross necklaces or cross pendants. Keep your devotional items intact with our Chi Ro Brass Pyx.